One of Spain's most important dramatists of the twentieth century and winner of the Nobel Prize for literature in 1922, Jacinto Benavente y Martínez wrote more than 150 plays in his lifetime. 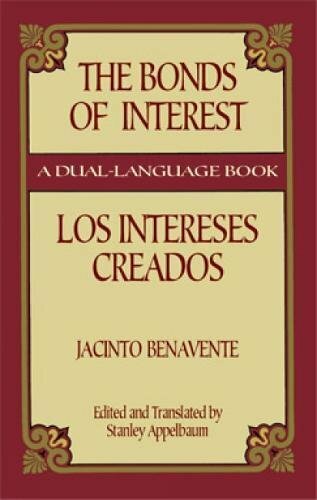 The best known of these is Los intereses creados — a social satire in the guise of farce. Premiering in late 1907, the work was instantly acclaimed throughout Europe. Similar in structure to a puppet drama, the play incorporates such traditional characters from the commedia dell'arte as the Doctor, the Captain, Harlequin, Columbine, Pantaloon, and Punchinello — with Crispin, a crafty and deceitful servant, manipulating them with invisible strings in the fashion of a spectacular puppet master. A sparkling satire on selfishness and greed in the modern world, the drama is reprinted here in a dual-language edition that not only allows students of Spanish to read a brilliant playwright's masterpiece in the original, but also provides readers with an excellent English translation of a theatrical classic.